Born and raised in Minnesota, Lucy Maynard Salmon Professor of History James Merrell studied at Lawrence University and Oxford University before receiving his PhD from The Johns Hopkins University in 1982. Before coming to Vassar in 1984, he was a Fellow at The Newberry Library Center for the History of the American Indian in Chicago and the Institute of Early American History and Culture in Williamsburg, Virginia. He has also received fellowships from the American Council of Learned Societies, the John Simon Guggenheim Memorial Foundation, and the National Endowment for the Humanities. 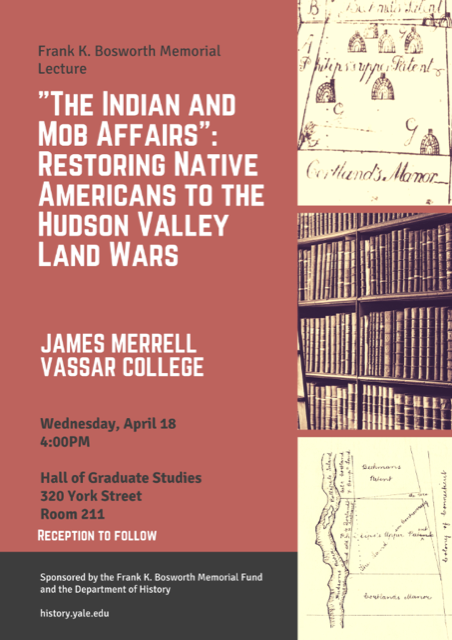 Professor Merrell’s teaching and research interests are in early American history (up to 1830), particularly the Indian experience in colonial times. His first book, The Indians’ New World: Catawbas and Their Neighbors from European Contact through the Era of Removal (University of North Carolina Press, 1989) won the Frederick Jackson Turner Award and the Merle Curti Award from the Organization of American Historians as well as the Bancroft Prize. His second book, Into the American Woods: Negotiators on the Pennsylvania Frontier (W.W. Norton, 1999), was a Finalist for the Pulitzer Prize, and won Professor Merrell his second Bancroft Prize, making him only the fifth historian ever to win that prestigious award twice.